Ah, February. A time for Valentines, Mardi Gras, roses, and....slowly going mad? 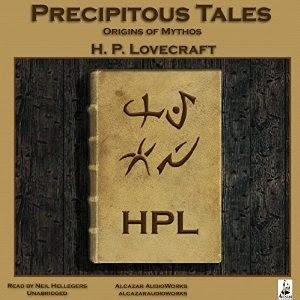 Precipitous Tales: Origins of Mythos features four of the master of horror HP Lovecraft's earliest short stories, retold by New York voice actor, Neil Hellegers. Accompanied by the ominous music expertly mixed in by the good people at Alcazar Audioworks, an independent audiobooks publisher based on the West Coast, it makes for well-produced suspenseful listening. Hellegers' deep, rich voice conveys a sense of cultured aristocracy with a tinge of the uncertainty of one who has experienced terror so great as to be scarred for all time. Most haunting is the fourth tale, "The Music of Erich Zahn," which tells of a young man who rents an apartment in a rambling old mansion and finds he has a rather...interesting neighbor. He is an old man who must play his music furiously through the night to keep at bay some kind of all-consuming evil force threatening to rip out of its world into ours at any moment. What is enjoyable about Hellegers' narration is the sense of doubt underlying his tones as he embodies the questionable psyches of the main narrative voices in each story. He understands that the characters in the story know how crazy they sound - and they don't care. All that matters is the story be told before it is too late. It helps that Hellegers doesn't take himself too seriously - he reads the work with a comfortable flow that eschews stodginess so often affected in retelling classic works of literature. His desperate, cautionary edge, honed to a sharpness with well-placed dramatic pauses and rising inflections, creates a polished finished product that will satisfy fans of Lovecraft and help usher in new ones. It is a great introduction piece to Lovecraft's writing, a prequel for the masterpieces that he would later write. Toby sez: Suspenseful, fun, engaging - A great homage to the works of a classic American writer. Well worth two hours of your time for a listen. Click below to hear an audio sample!